(WVUE) - Amanda Fyfe admits to being a little nervous about a first-time flight. On a recent morning outside the entrance to the Audubon Zoo, Fyfe, an animal keeper, opened the door to a plastic crate and a Eurasian eagle-owl flew to a nearby tree. The eight-month-old owl, Mr. Miyagi, has been at the zoo since he was a chick. Curators have been teaching the bird to fly without any kind of restraint. That means that while they are confident the bird will return, there is no certainty. "Working with animals, nothing is ever guaranteed," Fyfe said. This was Mr. Miyagi's first flight in the outdoors without a small, light line attached. "Pretty much right from the beginning, we started training with him," Fyfe said. After he learned to flap his wings, and eventually take flight, the young bird went to school. First, they flew the owl on a short line, then progressively longer ones. Finally, curators decided he was ready for a bigger space if only they could find one. From there, the story takes us to the city's largest room. "Obviously, in New Orleans, the Superdome comes to mind," Fyfe explained. "So, we kind of went out on a limb and reached out to them. They have been really wonderful and accommodating." The goal is to offer free-flight demonstrations for visitors at the zoo, to wow them as Mr. Miyagi darts from tree to tree. He and some other birds they've trained inside the security of the dome. "We can take that next step, knowing that if they do fly off, they're not really flying off," Fyfe said. "We just have to go find them in the Superdome." Curators say the planned show is not just for humans. "Allowing a bird to express its biggest instinct of flying is a big reason why we do this," said Lindsay Ezell, assistant curator. 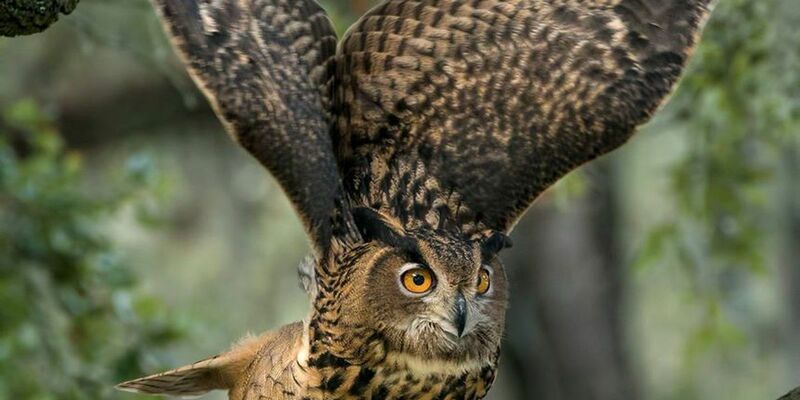 While Eurasian eagle-owl numbers declined significantly in the 20th century, they have recovered through laws and conservation efforts. "Coming from mountainous regions, unfortunately, where they come from and where they nest are commonly used for recreational purposes by humans," Ezell said. "So, these guys often abandon nests because of our activity around them." Mr. Miyagi carries a tiny transmitter while training, allowing curators to track his whereabouts in the event he flies off. On the recent solo flight, Ezell said she was confident it would go as planned. "I've learned that if you are not confidant, you shouldn't do it," Ezell said. "Birds can teach you a lot about life, especially free-flighted ones."